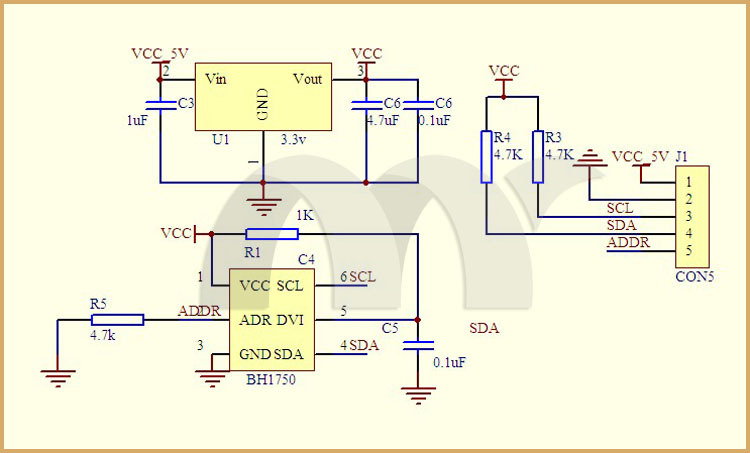 The BH1750 is a digital ambient light sensor which uses I2C to communicate. Unlike using a photoresistor and having to convert the analog value, the BH1750 provides you with a digital value in lux (Lx) over a range of 1 - 65535 lx. The module includes an on-board 3.3V regulator which makes the module compatible with 5V devices such as an Arduino. With this module you don't need to worry about adding pull-up resistors on the I2C lines since they already have on-board pull-up resistors connected to the 3.3V output of the on-board voltage regulator. The module's ADDR pin allows you to configure the device for one of two available I2C addresses. The default address is 0x23, but pulling the ADDR pin high will change the device's address to 0x5C. The ADDR pin's maximum voltage is 3.6V. If you don't want to change the default address then you don't need to connect anything to the ADDR pin since the module has an on-board pull-down resistor tying the ADDR pin to ground. The sensor works with just a few lines of Arduino code. Amazing device at a good price. Great price and very versatile sensor for measuring light levels as there are two choices for resolution and addresses.